Major donors to President Obama have received favorable treatment throughout his administration. Today’s news that solar company Solyndra is going bankrupt demonstrates the consequences of that apparent cronyism. The company’s demise is likely to cost taxpayers hundreds of millions of dollars. Solyndra suspended operations Wednesday and will soon file for chapter 11 bankruptcy and lay off its 1,100 employees. The company cited “regulatory and policy uncertainties in recent months” as the cause of its financial hardships, which have “created significant near-term excess supply and price erosion,” according to the company’s CEO. Solyndra is the third solar company to file for bankruptcy this month. The Energy Department bypassed its normal vetting procedures in awarding Solyndra a $535 million loan guarantee in early 2009, the Center for Public Integrity reported in May. Now, the company’s bankruptcy may stick taxpayers with the bill for that loan. The economic conditions that have put Solyndra in such dire economic straits – the “regulatory and policy uncertainties” to which its CEO referred – may have been perceptible, even when the company received the loan guarantee. But the Department of Energy did not undergo its usual financial assessment when considering that guarantee. “An independent federal auditor who has reviewed the energy loan program said moving so quickly without completing thorough reviews exposed the program to perceptions of political influence and put taxpayers at greater risk,” CPI’s iWatch News reported at the time. Fueling that perception was the fact that George Kaiser, one of Solyndra’s top investors, raised about $50,000 for Obama’s presidential campaign. The company benefited from another loan guarantee, this one for $10.3 million, as part of the Export-Import Bank’s “Renewable Express” program, which was created to encourage exports in the renewable energy industry. The Export-Import Bank’s president and chairman, Fred Hochberg, was also a major Obama donor, bundling an estimated $100,000 for his campaign. While it did not accuse the Department of Energy of engaging in political favoritism, the Government Accountability Office found in its audit of the loan program that the government had “treated applicants inconsistently, favoring some and disadvantaging others.” Solyndra was among the favored companies; Wednesday’s events confirm that it was not the company’s financial viability that earned it the federal loan. A year after the Energy Department awarded its loan guarantee to Solyndra, the company shuttered a production plant, raising concerns that the government had invested in a financially unviable enterprise. 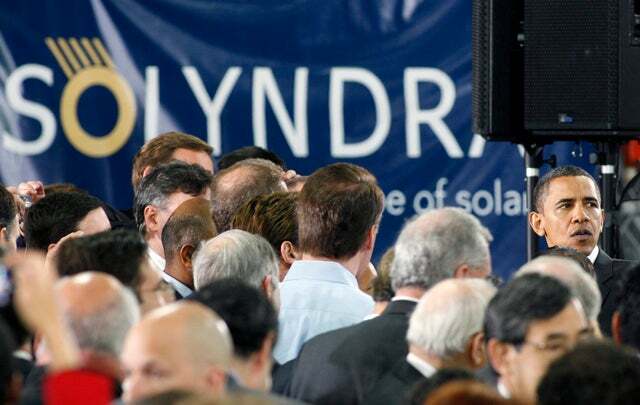 Solyndra’s impending bankruptcy seems to confirm that suspicion. Since DOE guaranteed the loan to Solyndra, the solar industry has been feeling the pinch of declining prices due in large measure to a sudden drop in expenditures from European governments. Countries such as Spain and Germany were forced to scale back their massive renewable energy purchases when the global economic downturn caused a shortage in tax revenue. The result was a decrease in demand for solar projects, and a resulting decrease in prices. Some firms have been able to weather that decrease better than others. Clearly Solyndra did not have the necessary financial resilience. While economic shocks inevitably drive some companies out of business as a necessary function of the market (though, it should be noted, government intervention in the market was responsible for this particular shock), in Solyndra’s case it’s not just a handful of investors who will lose money when the company goes under. American taxpayers, who helped finance the company, will lose out in this deal as well. “We have always recognized that not every one of the innovative companies supported by our loans and loan guarantees would succeed,” an Energy Department spokesman said on the news of Solyndra’s coming bankruptcy filing. But it would seem that the federal government would attempt to minimize its losses by assessing an enterprise’s viability before promising to lend it half a billion dollars. Solyndra’s financial success was never a sure bet, of course, but the Energy Department’s vetting process may have recognized the potential pitfalls of reduced European spending on the industry. That process was “meant to protect taxpayers,” iWatch noted. That lack of protection may have resulted in a potential loss of the funds lent to Solyndra. Energy and Commerce opened its investigation into the matter last month, citing concerns that “the company was a financial risk that government analysts should’ve picked up on,” Politico reported. We may never know whether Energy Department would, in fact, have picked up on those risks. But that only underscores the importance of a full examination of a company’s finances before it receives federal funding. Though the Energy Department and Solyndra deny that political considerations influenced the company’s favorable treatment, the company is just one among many firms owned, operated, or financed by a major Obama donor that have enjoyed such treatment. In fact, “nearly 200 of his biggest donors have landed plum government jobs and advisory posts, won federal contracts worth millions of dollars for their business interests or attended numerous elite White House meetings and social events,” Politico noted in March, citing iWatch’s investigation. Another one of those donors owns a venture capital firm with four renewable energy companies in its portfolio that have also received more than $500 million in loans, grants, or stimulus funds. One hopes they fare better than Solyndra. Clarification: Solyndra received two loan guarantees from the federal government – one from the Export-Import bank and one from DOE – totaling more than $545 million. This post has been updated to make that distinction clear.